I've paused wondering why it is in both places? Did the Christians steal this for their stories? Or were these stories passed down through years ultimately ending up in the bible writers hands? It is conceivable that the later of these thoughts is what happened even though both are very conceivable. A biblical canon or canon of scripture is a list of texts (or "books") which a particular religious community regards as authoritative scripture. The word "canon" comes from the Greek κανών, meaning "rule" or "measuring stick". This means groups of people came together and decided what a mass amount of people would believe...they basically decided what the rule of authority would be as far as bible scriptures were concerned. So with this being said it's very possible these were passed down stories or even stolen stories from other philosophies / spiritual beliefs. "I imagine which ever you believe would be based on your own perception of how you see the world"
It's almost impossible to completely understand the intentions of the bible writers since we were not there with them. (Luke 16:19–31). Lazarus was very poor, probably homeless, and definitely a beggar (verse 20). He often stayed at the gate of a rich man in hopes of getting scraps from his table. Both men died, and Jesus tells of how Lazarus was taken to “Abraham’s side,” a place of comfort and rest, while the rich man when to “Hades,” a place of conscious torment (verses 22–23). 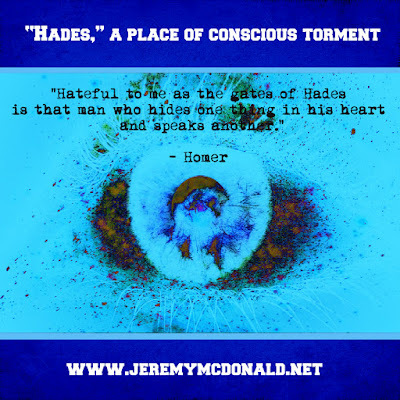 So maybe we should first talk about what HADES is? First let's start with the bible verse above because this tells us there is a place of comfort and there is a place of conscious torment... these would apparently be two very different places... or at least one would think? What if it is one place? what if HADES is "US"? NOW as to Hades, wherein the souls of the of the righteous and unrighteous are detained, it is necessary to speak of it. 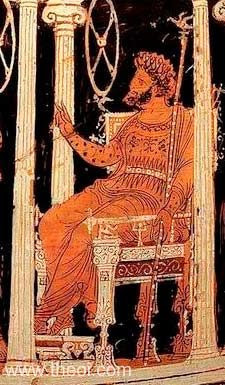 Hades is a place in the world not regularly finished; a subterraneous region, wherein the light of this world does not shine; from which circumstance, that in this region the light does not shine, it cannot be but there must be in it perpetual darkness. This region is allotted as a place of custody for souls, ill which angels are appointed as guardians to them, who distribute to them temporary punishments, agreeable to every one's behavior and manners. In this region there is a certain place set apart, as a lake of unquenchable fire, where into we suppose no one hath hitherto been cast; but it is prepared for a day afore-determined by God, in which one righteous sentence shall deservedly be passed upon all men; when the unjust, and those that have been disobedient to God, and have given honor to such idols as have been the vain operations of the hands of men as to God himself, shall be adjudged to this everlasting punishment, as having been the causes of defilement; while the just shall obtain an incorruptible and never-fading kingdom. These are now indeed confined in Hades, but not in the same place wherein the unjust are confined. 1. The righteous and unrighteous go and to me this is saying that every soul goes there whether they are sinners or non-sinners. This to me would indicate that HADES is a place of reflection and experience. 2. Wherein the light of this world does not shine; from which circumstance, that in this region the light does not shine, it cannot be but there must be in it perpetual darkness. The darkness to me is the "Veil" that is cast over all of us as souls on Earth. The Veil keeps us in constant darkness so we cannot see and the only way we can get out of this darkness is to have faith that our Over-soul will guide us out of darkness. What binds us? It's interesting because the story of the Titans in the Greek myths as well as the Fallen Angels in Christianity tell us they were cast down into a dark place far below Hades and this place according to the Christians beliefs was a place of great torment. This is my thought and would you consider.... ? This is not to say we are to go run rampant and do whatever we want.... Natural Law Governs the flow of how things manifest even for great beings such as ourselves. When we consider the Titans and Angels were great beings and Lucifer was the Morning Star and now enemy? Is this not a metaphor about making LIGHT (TRUTH) the enemy...and now we have created a world afraid of facing the truth... a world afraid of facing our true nature as the great beings we truly are...and as we deny who we are we continue the cycle of living in the land of Conscious torment... living the same nightmare over and over again until we finally says enough! and embrace our birthright as great beings of light. So how does this stop? I think the best way is to work on ourselves first and then as we understand ourselves and as we take the journey to open ourselves up to universal consciousness / over-souls ...then we will be able to work on the rest of the world. Think about this for a moment... have you ever helped someone with all the greatest of intentions and as you were helping them they were in great resistance ... the more and more they resist the more and more you feel unappreciated or maybe even misunderstood... eventually this scenario might build into a fight between you and this person because of how much their actions are hurting you. So what does this have to do with this article about Hades? Well think about this...if in this situation we are tormented it means we are holding on to something or we are not strong enough in ourselves emotionally to handle this situation. "What if they did not want my help? What if I am trying to impose my will on another person?" Any time we are trying to control another human being whether our intentions are good or not then we will create a world of torment for ourselves. A good majority of times it's time for us to "Let it go or let someone go..."
Let me end by saying ... by no means do I consider myself an expert but these thoughts are just something for us to ponder and maybe inspire us to dig even deeper then the thoughts I am putting into this blog. I welcome each of you to comment below your thoughts to create a dialogue. Respectful dialogue can help us all grow spiritually. Let me help you find understanding. The notion of "hell" is explained by Enoch who was and remains canonical despite the fact the the council of Trent removed his text from the bible. It took the Christians almost 800 years to figure out Enochs words for what they are. They are the truth and the church has never let truth get in their way. Enoch explains hell, and Ascension as well as telling us precisely who will be behind the darkness that is referred to in the bible as the battle of the Armageddon but in every other spiritual dogma on earth, it is the battle of good and evil that must be fought to end the Age. There have been three so far, and the fourth just kicked off with the first salvo being fired by the army of light flooding the CIA's network of tunnels in their Durham California compound. 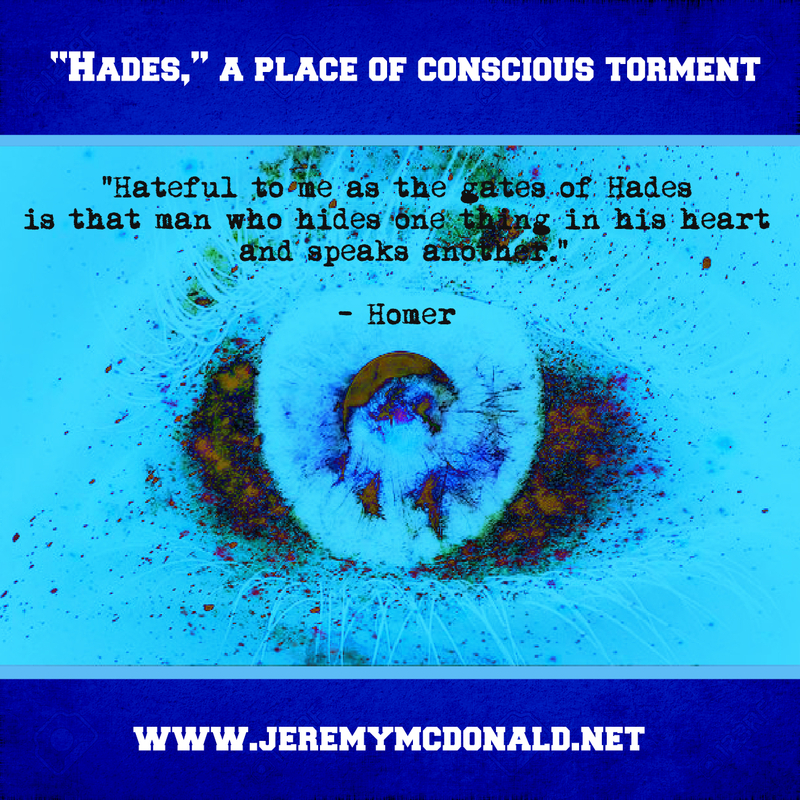 Hades is the underworld where hell is actually a place on earth. True hell is a place where you are sent when you have accrued 2000 lives in karmic debt. It's where you are placed with other like minded persons to find the understanding about the way it is. There is a hell in every state of the union and countries that do not have states or Provences, like England, have a city that functions in that capacity. Hell is a place that has low wages and high prices. The layout of them make it hard to find your way around. Basically, it's a place where all the parking spaces are small and everyone drives a big truck. I do know a handful of people that have successfully climbed out of hell. It takes work. The problem is that there's a lot of churches in hell. This is caused by the council of Nicea lied to everyone and sold them on the "forgiveness" plan. There is no forgiveness at judgement. Karma is not transferable to anyone. You must reconcile your actions to the cosmos. When they figured they were going to be forgiven, Christians proceeded to do mean things to people and many have dug themselves into a pit of karmic debt that they cannot climb out of. Revelation 20:10-12 tells us about the truth in that passage. In verse 12, you are judged by your "works". In verse 10, there are two books that are mentioned. The second book, the book of life is named. The first book is unnamed but each of the "Dead" possesses their own book. That book is the Akashic record. That's your karmic account. Here's the crux and the reason that you have been shown to me. Jeremy, the Old Man, who is the God that hears people's prayers, and prefers "Creator" or Architect of the Universe" has shown me to you because we are at the end of the road. There is no more time to find the understanding that you need to ascend to heaven. You, kind sir, do have the answers to the entrance exam, except one answer you lack. You need to acknowledge the Creator for who he is. You have come to the notice of the cosmos and have paid your of karma forward quite a bit with the understanding that you not only possess, but seem to distribute freely, which makes the Old Man tickled pink. Those that profit by the knowledge do not fare so well. But for you to help so many others understand and then get to the gate and flunk out because of the easiest question, seems a shame. You wouldn't get much of another shot at it, so, He has directed me to help you understand. As for my place in all of this, lets just say, "I'm the guy". The current hat I wear is "Melchizedek" but any dogma that tells the tale has a different name that are all the same man. I am known by many names. I am In the bible more times then I can imagine. Because of the council of Nicea bid to eliminate any notion of reincarnation they omitted texts on mythology and genealogical understanding. By doing so, they actually reversed the whole text. The entire bible is backwards but that doesn't make any difference until the "creature of dark" makes his entrance in Revelation. The creature of light has been mistakenly placed in the creature of dark's role. There are several tells to help you grasp the notion. The individual in the throne in rev.1 has seven stars and seven lampstands, that the framers did not understand and called it "mystery of Revelation". Those are talismans and sigils which are the tools of a sorcerer. The second chapter of Revelation has Him "selling" gold. Trust me, the Old Man has no use for money nor gold. The whole book of Revelation abounds with the "council of elders". Dude! Where is the Architect of the Universe" going to find one elder, let alone twenty four elders? That being said, in Revelation , I am represented as the seven headed beast that rises from the sea. That is before I get shoved through the bright light. Once that occurs, I will return as the "son of man". The cloud that I am going to be sitting on in Rev 14, is about the battle of the Armageddon , as the army of darkness has been creating hydrogen filled clouds that can be made invisible with phased array optics camouflage. I hope that you find understanding in my words. I would be glad to answer any question that you might have. You can find my "work" page on Google+ and there are many answers to be found there. As for the exam when you get to gate. Two questions and understanding of the Four Noble Truths, which is about the Buddhist concept of suffering. Other than these questions, you must have your karmic account in the light side. Yours apparently is pegged way up in the light. I wish you well on your journey, friend. You have been recognized for your work. I do look forward to meeting you in a different place in a better time. Like I said, any question that you have about what is, just ask. I'm about as approachable as a Messiah can be. Be well, Jeremy E McDonald.